Profit apportionment, or the portion of economic benefits that can be attributed to a specific intellectual property, is a key component of intellectual property valuation and economic damages calculations. Brian will be discussing approaches to analyze profit apportionment, including presentation of the Apportionment Matrix Nevium uses to support profit apportionment opinions for economic damages calculations in IP litigation and for IP valuation. If you are not able to attend NACVA Annual Conference, please contact Brian to learn more about profit apportionment and IP analysis. How to value brands that won’t be acquired? Cities, governments, not-for-profits, celebrities, professional associations and many other organizations can benefit from powerful brands. While many of these brand owners permit their brands to be used by others through licensing, these brands are unlikely to be acquired in the traditional sense that a corporate brand might be the target in a corporate acquisition. So how does the owner of a brand that won’t be acquired understand the value of their brand assets? Brian Buss of Nevium led a discussion with the Provisors Branding, Licensing and Intellectual Property affinity group in Los Angeles on this very topic. The key to valuing these brands is quantifying how the brand contributes to the organization’s financial performance. Nevium has applied a profit apportionment model to answer this and similar questions for brand owners outside the classic corporate world. With an understanding of the brand’s contribution to financial performance and the value achieved from leveraging brand assets, brand owners have been able to update revenue models, optimize prices charged for their services, diversify funding sources and enhance operations. Leveraging brand assets often identifies opportunities for organizations to achieve their missions more efficiently and effectively. 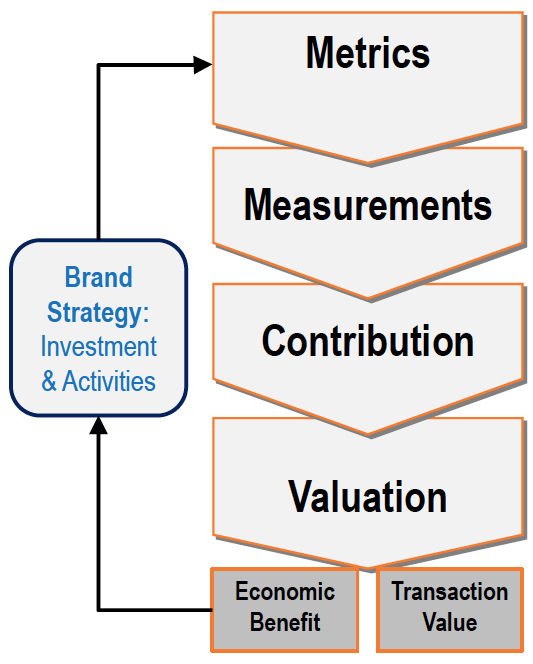 The attached slides led the discussion and introduce Nevium’s approach to brand valuation using a profit apportionment model. The Tax Cuts and Jobs Act (the “Tax Act”) introduced changes to the U.S. tax code in December 2017. Taking effect in 2018, tax reform is expected to have a substantial impact on both US and global business, including the valuation of intellectual properties and intangible assets. From a valuation perspective, the value of any asset is based on the present value of after-tax cash flows to be generated from ownership of the asset. This is true for IP assets as well. Any cash flow that can be apportioned specifically to an IP asset will increase if a lower tax rate is applied. Therefore, all other things being equal, the value of IP assets that contribute to the generation of cash flows at a business will increase based on the now lower tax rate. This is simple valuation math: lower tax rate equals higher after-tax cash flows. IP can contribute to cash flows by enhancing the financial performance of the business using the IP, or through generation of royalties in a licensing transaction. To value IP assets based on their contribution to financial performance, the valuation analyst needs to undertake an apportionment exercise. The apportionment analysis assigns a portion of cash flows to each of the assets and resources that are used in the process of developing and selling the product or service. If a patent can be apportioned to 10% of a product’s cash flows, the patent’s valuation is based on 10% of the product’s forecast cash flow. Apportionment is the exercise employed to determine the 10% apportionment rate. The valuation of any royalties generated by licensing transactions will also be subject to a lower tax rate. All else being equal, lower tax rates should increase the value of cash flows generated by IP assets. To date, many businesses with operations in multiple tax jurisdictions have used IP assets to lower their corporations overall tax expense. This works by domiciling the IP in a subsidiary located in a lower tax rate jurisdiction. Operations in higher tax rate jurisdictions pay a royalty to use the IP in order to lower their tax exposure in the high tax jurisdiction. Such transfer pricing is a topic beyond the scope of this post, but the Tax Act should change how IP owners employ their IP assets. With lower tax rates on corporate earnings, the benefits of transfer pricing transactions are likely to be reduced. Therefore, rather than viewing IP as a means to avoid taxes, corporate IP owners should now focus more attention on strategies to leverage their IP into additional earnings. As IP Strategy advisors, Nevium has helped companies ranging from non-profit organizations and rock bands to consumer products and technology companies identify and execute strategies to leverage their brand assets, copyrights and patents into additional earnings. Our work has included analysis of potential licensing opportunities, evaluating acquisition offers, and quantifying the impact of new pricing strategies. We suggest more IP owners consider new strategies to leverage their IP. Nevium’s Brian Buss will moderate a Panel Discussion on Brand Contribution at the LESI 2018 Annual Conference San Diego. The LESI 2018 Annual Conference San Diego will be held at the Manchester Grand Hyatt in San Diego from April 29 through May 2, 2018. Nevium principal and valuation expert Brian Buss will be moderating a panel featuring leaders from San Diego companies discussing brand contribution, how to build, protect and leverage brand assets. The Brand Contribution will start at 4pm on Tuesday May 1, 2018. The complete schedule for the conference can be found at the LESI 2018 Annual Conference San Diego. Lawrence Maxham is the President of The Maxham Firm and an AV Rated intellectual property attorney. The Maxham Firm is a San Diego-based intellectual property law firm providing IP development, prosecution and protection. John Sarkisian: is a serial entrepreneur who has built and sold several companies, including the regional fast casual restaurant company Pat & Oscars, which was sold to a public company, and SKLZ, a sports training enterprise that was sold to private equity. John is now a partner in Motion Ventures, as well as Industry Chairman of San Diego Sports Innovators and Vice Chairman of YMCA of San Diego County. Mark Chong is a Senior Manager, Integrated Brand Marketing at Hologic, Inc. (NDQ:HOLX). Tom Hume has over 20 years of experience managing marketing campaigns, branding, direct-response marketing and channel programs for Consumer and Business brands including Cali Bamboo, Toshiba, Qwest, Sage Software, Gateway Computers, Sprint, and Verizon. Jennifer Struebing is COO & Partner of Balboa Manufacturing a designer and manufacturer of products for the motorcycle, powersports, outdoor, military and safety markets. Now that the holidays have ended and everyone is getting back to work, we at Nevium Intellectual Property Solutions want to share some of our successes during 2017 and wish everyone continued success in 2018. Nevium’s trial-tested experts, Doug and Brian, have provided testimony in State and Federal court, arbitration and mediation proceedings, US Tax Court, and many expert depositions. Let us know if you are interested in hearing how we can help you build a better brand strategy. In addition to an update for our Chapter Using Internet Analytic Tools for Valuation and Damages Calculations in Internet IP Infringement and Defamation Cases, Brian and Doug were invited to contribute a new chapter presenting a process for profit apportionment when calculating damages in IP litigation. Both chapters will be published in the 2018 edition of The Comprehensive Guide to Economic Damages, to be published by Business Valuation Resources.